Warranty on all the items we offer. PVC, Polyflex, Saran,Polyproylene, Mylar, Nylon and and other heat sealable materials. Capable of sealing 15-20 bags per minute. Make Custom Bags from rolls of poly tubing, any length. Very versatile machines. 16" long meshed Seal 5/8" wide. Constant heat with teflon jaws. Dried Food items, many industrial uses. readiness of temperature for usage. 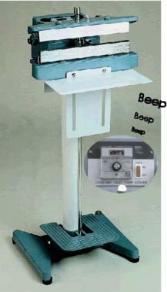 stand, adjustable work table and foot control. Units come with 6 Month Factory Warranty. "tail" of sealed bag for better look. 2MM & 5MM element wire are available. All spare parts available. 6 month Factory Warranty. 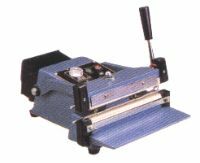 YC Series comes with a sliding cutter and a U-shaped sealing bar. An ideal sealer for poly tubings. 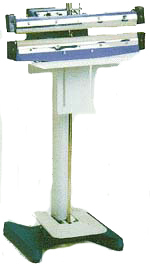 a rectangular steel frame stand. Manufacturer replacement's kit includes 2 elements and a knife. 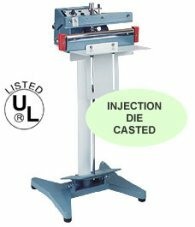 Cut length 16" With sliding cutter blade. Cut length 22" With sliding cutter blade. that may contain loose items like powders, grains, liquids, etc. material from both sides at the same time in less than a second. 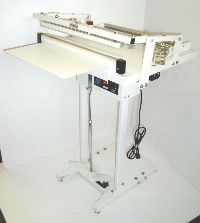 Come with adjustable work table. 10mm wide seal available on these Sealers contact us for pricing. 6 Month Factory Warranty. 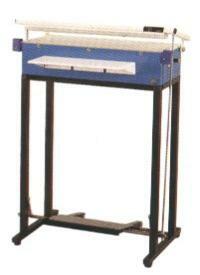 Manufacturer is ISO 9002 Certified. /Fax/ or e-mail to order spare parts. replacement kit includes 2 heating elements.